Are You Pond Jumping Too Early? For those with immigrant ancestors, it’s tempting to start researching in the home country as soon as they learn the country from which their ancestor came. However often that is not the best approach. Completely researching the immigrant in the area of settlement may give additional clues as to the specific point of origin or the names of relatives and associates in the new country who also lived near the immigrant in the old country. What Goofiness Did You Get In Your Head? In reviewing research on my Irish immigrants, I realized that somewhere along the line, I made an incorrect conclusion. I “got it in my head” that the bondsman on the 1865 marriage of my ancestors appeared as the bondsman on numerous bonds and probably was not a relative for that reason. When I went back and reviewed the records, the bondsman was a bondsman on only one bond: the one for my ancestors. Anyone registered will receive a complimentary copy of the download after the presentations have been recorded. Even if you can’t attend live, register and get the recorded copy a few days after the session. There are more details here. Genealogy Tip of the Day is proudly sponsored by GenealogyBank. 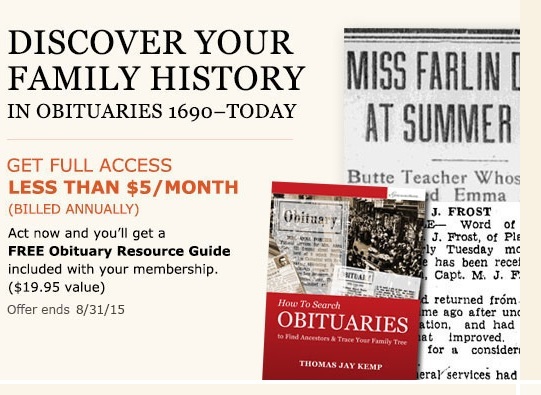 Their August offer to our readers is an annual subscription that equates to $5 a month. Subscribers who join during August also get their free “Obituary Resource Guide.” Offer ends 31 August–don’t wait! Part of the work on a relative in upstate New York centered on searching for him in land records. In establishing a time frame in which he could appear in those records, it’s good for me to remember that he would not be purchasing real property before his twenty-first birthday. I don’t need to look for him in land records before he was of legal age. Minors who obtain property through an inheritance usually can’t perform legal transactions on that property in their own name. If the property needs to be sold, a guardian typically is appointed to handle the transaction. How Many Descendants Have You Tracked? I’m “stuck” on my Thomas Chaney who died in 1856 in Bedford County, Pennsylvania. In reviewing my material on him, I realized that I have several of his children who I have not tracked down. Of his nearly ten children who grew to adulthood, I have significant information on the descendants of one and a scattering of information on descendants of one other. Maybe it’s time to research his children more fully than I have in hopes of locating more on him. Sometimes getting away from your research for a few minutes and thinking about something else can be the best “brick wall” breaker there is. Child Born Before the Marriage? Your first conclusion about the scenario may be correct. Or it may not be. Research the family as completely as possible, then see if a conclusion can be reached. If your ancestor was divorced, do you know if there were any restrictions on when they could marry again? In some locations in some time periods, a divorced person may have had to wait a certain amount of time before they could marry again. if you’d still like to order, we can take orders through the end of the month. Just make certain you download the file as soon as the download link comes through. You don’t have to view immediately.